The 2014 World Cup certainly did not turn out at all the way Brazilians had hoped it would on the playing pitch. But in terms of international tourism the South American nation scored a success according to government officials, who released data they say shows Brazil’s World Cup visitors were mostly young and affluent, and plan to return to the country soon. 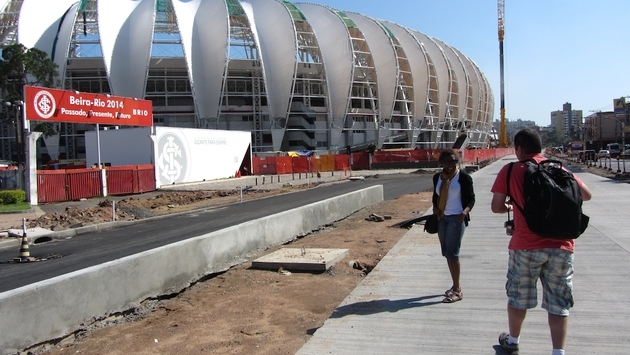 Vinicius Lages, the country’s minister of tourism, said 25 percent of World Cup travelers were between 25 and 31 years old and 95 percent expressed “a high level of desire” to return to Brazil. “This combination opens an excellent opportunity for tourism in the country,” he said. In addition a large majority of foreign visitors (87.5 percent) were male; most have college or post-graduate degrees (77 percent); their average income is $56,400 per year and they spent an average of $2,099 in Brazil on expenses including lodging, meals, internal transportation, shopping, attractions and tours. A majority of travelers (61 percent) were in Brazil for the first time, Lages said. Foreign World Cup visitors spent an average of 15.7 days in Brazil, traveling to a combined 491 municipalities. The Brazilian states of Rio de Janeiro (71.2 percent of visitors surveyed), Sao Paulo (44.6 percent) and Minas Gerais (21.3 percent) received the largest visitor numbers. Brazil’s hosting of the 2014 World Cup had already proven popular in the social media sphere. The one billion World Cup-themed Facebook posts, likes and comments created during the tournament’s first half made it the most talked-about event in the social media site’s history according to a Reuters analysis. The World Cup also generated 618,725 Twitter tweets per minute during the July 13 final match, a record according to company officials. In all one million foreign tourists visited Brazil during the World Cup, far exceeding the 600,000 expected prior to the games. The event was also highly popular among soccer-loving Brazilians, despite the deflating outcome. A total of 3.4 million people attended the matches at 12 stadiums around Brazil. The total is the second-highest ever in the World Cup’s history, say government officials.